Gregstrom’s rotational molding capabilities were featured in the September 2017 issue of Rotoworld magazine. Learn more about the “Swing Time”” project. Article by: Susan Gibson, JSJ Productions, Inc. Swing Time is a rotationally molded, interactive, and lightenabled swing that is uniquely tailored to the user. The hugely successful project, commissioned by the Massachusetts Convention Center Authority (MCCA), was designed by awardwinning Höweler + Yoon Architecture of Boston, MA and rotomolded by Gregstrom Corporation of Woburn, MA. 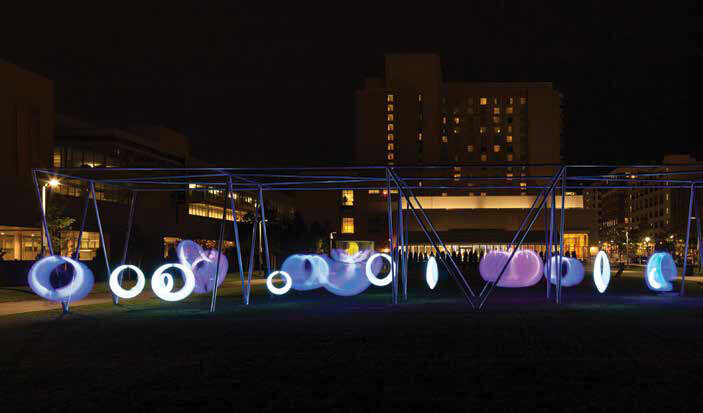 The challenge was to create an interactive space for residents in an urban setting and reflect the playful nature and purpose of The Lawn on D — a contemporary sculpture park bordering on the Boston Convention and Exhibition Center and D Street on the city’s southern waterfront. “The swing’s responsive play elements invite users to interact with the swings and with each other, activating the urban park and creating a community laboratory in the Innovation District and South Boston neighborhoods,” said principal architect Eric Höweler. The MCCA was looking for a “people experience” as a temporary expo and part of the future development of The Lawn on D. Real estate development around the area was in early stages, therefore the intent was to create a temporary space that would draw people to a public place of interaction — somewhat like the Hi-Line does in New York City. “Activation” had become the buzz word of the day, so the space would need to be cool, interactive, beautiful, and lightly sculptured. When Höweler + Yoon first looked at the project, they wanted to incorporate playfulness. They initially imagined designing merry-gorounds, seesaws, or jungle gyms. After trying all sorts of playground elements, the swing emerged from the concept of “swings and hammocks” and incorporating the idea of micro-controllers to allow the swing to know when it is being used so it could light up and change colors. In this way, the swing would provide a bit of feedback and pleasure to the user. They envisaged something like a vineyard full of swings hanging from a canopy above or a field of swings.